Renowned Nelson-based family bakers Oddie’s has been confirmed as a key sponsor of the town’s Food and Drink Festival on Saturday September 19th. 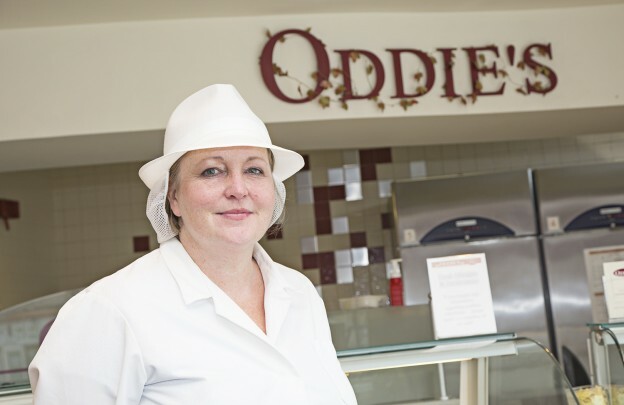 Established 110 years ago and with 16 shops across East Lancashire, Oddie’s is a local institution and a firm favourite with generations of folk who appreciate top quality locally baked bread and cakes and delicious pies and pasties. The festival is the culmination of a four-month campaign to promote Nelson’s town centre and its array of independent shops and businesses. It is the brainchild of Nelson Town Team, which appointed Burnley-based Scott Dawson Advertising to run the promotional campaign. A dedicated website (www.neslonfoodfestival.co.uk) is already up and running and will evolve throughout the campaign. A “Nelson Shops & Events” YouTube channel has been set up, featuring a dozen short videos showcasing local shops and businesses, with more being added all the time. A social media campaign is under way to promote the town through Facebook (www.facebook.com/nelsonshops) and Twitter (twitter.com/nelson_portas), banners will go up in the town centre and a Food Festival brochure highlighting all the attractions will be distributed to 25,000 local homes nearer the event. Key attractions will include a host of food stalls in the town centre ranging from traditional Lancashire produce to Asian delicacies and a Continental Market section. There will be live cookery demonstrations hosted by celebrity chef Richard Fox, who starred in ITV’s “Men Brewing Badly” alongside actor Neil Morrissey, plus street entertainers and activities for children. Part of Oddie’s involvement is to sponsor a “Cakelicious” children’s cake decorating competition by donating hundreds of delicious plain buns and all the materials to decorate them. Oddies is also sponsoring a town centre banner and advertising in the festival brochure. Earlier this year Scott Dawson Advertising ran a similar food festival in Accrington, attracting more than 10,000 people into the town centre and market hall, where businesses have felt a sustained benefit. Lara Oddie, who is also vice-chair of Nelson Town Team, added: “Oddie’s got involved in the Accrington Food Festival by sponsoring a face painter outside out town centre shop. It really gave a boost to Accrington as a town and to a lot of businesses ever since, so I had no hesitation in getting involved with the Nelson Food and Drink Festival in the hope it will do the same here. Other Nelson shops and businesses wanting to get involved in the campaign or the Food Festival on September 19th can contact Sue Lawson at Scott Dawson on 01282 423846 (email: sue@scottdawson.co.uk) to discuss the various options. This entry was posted in events, food festival, Nelson and tagged food festival, Nelson, oddies on July 7, 2015 by admin. 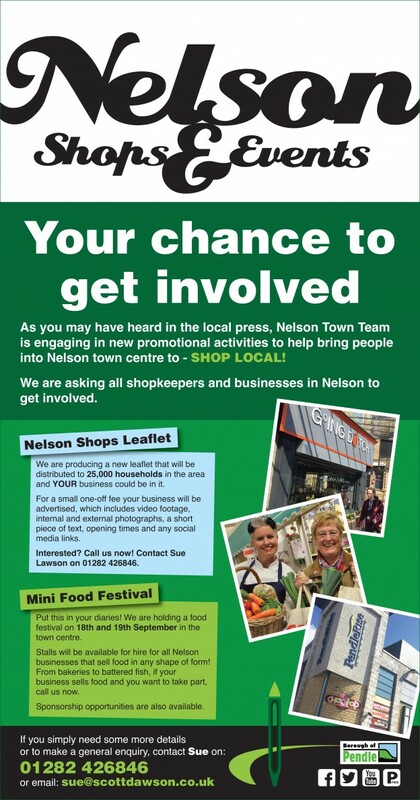 As you may have heard in the local press, Nelson is engaging in new promotional activities to help bring people into the town centre to – SHOP LOCAL! We are asking all shopkeepers and businesses in Nelson to get involved. We are producing a new leaflet that will be distributed to 25,000 households in the area and YOUR business could be in it. For a small one-off fee your business will be advertised, which includes video footage, internal and external photographs, a short piece of text, opening times and any social media links. Interested? Call us now! Contact Sue Lawson on 01282 426846. Put this in your diaries! We are holding a food festival on 18th and 19th September in the town centre. Stalls will be available for hire for all Nelson businesses that sell food in any shape of form! From bakeries to battered fish, if your business sells food and you want to take part, call us now. This entry was posted in Nelson, Shop Local and tagged events, food festival, Nelson, shop local on May 18, 2015 by admin. 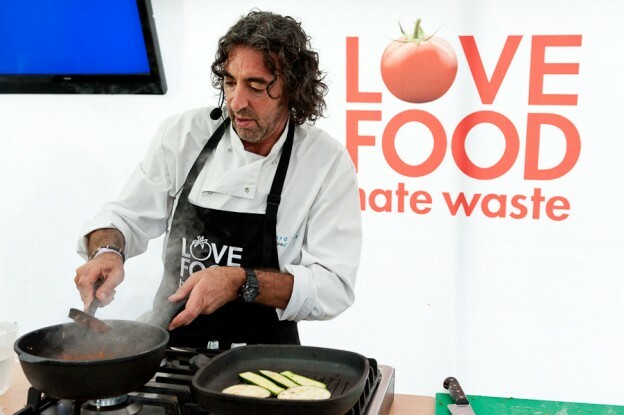 Celebrity chef Richard Fox will be the guest star at the Accrington Food and Drink Festival on Saturday, June 6. Richard, dubbed ‘The Beer Chef’, will front this year’s cookery stage on Accrington’s Broadway, with more than 4,000 people expected to attend the festival, which is free to enter. A host of culinary delights, proudly produced by local farmers and independent traders, will be available for visitors to sample during the special one-day event. And Richard, who wrote The Food and Beer Cook Book and starred in the ITV series Men Brewing Badly alongside Neil Morrissey, is set to be the star attraction as he demonstrates his cooking skills. Mr Fox, who has a strong family affinity with Lancashire, specialises in turning leftovers into gastronomic masterpieces. The Accrington Food and Drink Festival has a proud history of attracting TV cooking personalities with James Martin and Gizzi Erskine among those to have previously attended. The event will also commemorate the 71st anniversary of the D-Day landings, while two historic buses will transport families from around the area for a small fee. www.accringtonfoodfestival.co.uk or contact Kirsty at kirsty@scottdawson.co.uk or on 01282 426846. This entry was posted in Accrington, event management, events, food festival, Hyndburn Council and tagged accrington, food festival, hyndburn, richard fox on April 30, 2015 by admin. Do you need Creative Photography and Video? SDA chosen to wrap Team Network Q Adam R2 rally car. Need an Interim Marketing Manager or Marketing Director for short term projects? We know how important it is to understand how your customers think and behave. Our campaigns are built on rock-solid foundations, simply because we do our homework. By thoroughly researching your industry, target audience and objectives, we create marketing solutions that push your buttons every time. Copyright © 2014 Scott Dawson Advertising All rights reserved.